Consumption of stimulants, e.g. coffee or alcohol. When you have a strong heart, you feel active, healthy and energetic. At the same time this will reduce the risk of coronary heart diseases and problems connected with aging. The stress level during daily tasks will decrease and you will be able to work more effectively. To achieve all these benefits of regular aerobic exercise, it is important to do the workouts safely at the right intesity level. Heart Rate Monitors measure your cardiovascular and physiological stress during training sessions and during daily living. 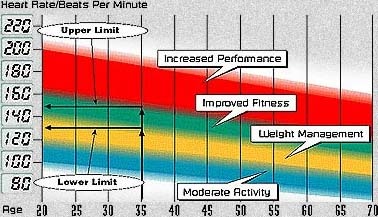 They provide you with an accurate gauge of the intensity of an exercise, as this will be reflected in your heart rate. The harder you exercise, the higher the heart rate. Because hard work alone does not guarantee better results, it is important to exercise within your personal target heart rate zones. Whatever your goals - improving your overall health, weight management or winning athletic competitions - you can eliminate guesswork by exercising within a specific target heart rate zone. The target zone chart below shows age-related average heart rates (based on estimated maximum heart rates) which enable you to achieve your personal goals. You can exercise effectively within a target zones only if you know how fast your heart is beating throughout your workout. And now, wireless electronic heart rate monitors make heart rate monitoring easy and fun to do. Exercise duration 30 min - 1 h (even up to 2 hrs) 30 min - 1 h (even up to 2 hrs) 30 min - 1 h (even up to 2 hrs) depends on training programme etc. depends on training programme etc. Exercise frequency 3-5 times a week (even daily) 3-5 times a week (even daily) 3-5 times a week (even daily) depends on training programme etc. depends on training programme etc. It is strongly recommended that people take a medically supervised fitness test to determine their maximum heart rate and ideal exercise training zones. If that is not possible, then the chart below will can serve as a rough starting point for a fitness program. Some individuals will find that the zones are too hard, others may find them to easy. The following Target Range Chart gives a rough approximation of your target zone. Locate the target which you have just determined. Each target is shaded differently. Read up from your age to the target you have chosen. Draw a straight line to the left from the upper edge of the target and you will find the Upper Limit of your Target Zone. Then draw another straight line to the left from the lower edge of the target and you will find the Lower Limit for your Target Zone. You have now defined your Target Zone. As you exercise, make sure that your heart rate stays within the Target Zone (between the Lower Limit and the Upper Limit) to get the maximum benefit out of your workout. To know your exact intensity level, you should consult your doctor or trainer. In any case, you should consult a doctor before starting any strenuous exercise program.